Back with another video :) I've been meaning to do this one for a while, but I had to wait a bit since I needed the correct products. I've been raving about Eve Pearl products for so long. I was especially excited to try her HD foundation and Salmon Concealer. She always makes makeup look so simple and easy. The good thing about her products are that many are multi-tasking and time saving. In terms of selecting the right shade, I initially thought I was Medium but it was too light for me, even in the winter. Instead, I'm the next shade up - tan. For all of you ladies NC40-43, this is the shade for you. I love how this foundation is super creamy and smooth. It's not greasy or too thick and dry like some cream foundations. When Eve Pearl applies foundation, she emphasizes the fact that you should still be able to see your own skin shine through. This foundation gives you the flawless look of perfect skin...you can't even tell you're wearing makeup! For those of you who can't watch the video, here are the products and steps for you. 1) Start off with a clean face. 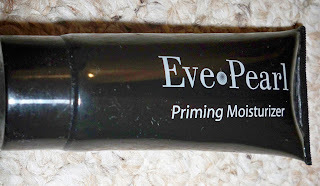 Then apply Eve Pearl priming moisturizer to the entire face and neck. This is double duty - it not only moisturizes, but also primes the skin for foundation. The consistency is very liquid-like, so be careful not to let it tip over or you might lose some product. I spread mine out on a palette and used a foundation brush, but you can also apply it with clean fingers. 2) If you tend to be oily, Anti-Shine will be your new best friend. After priming/moisturizing, apply the Anti-Shine in spots that tend to grease up - i.e. the t-zone. I used Light/Medium but it is also available in Tan/Dark. After all your makeup is done, you can also apply this afterwards as a touch up product. 3) Time for foundation! I tested both shades on my jaw and found that I'm right in the middle. I mixed 1 part light side and 1 part dark to find my perfect shade. If you are a makeup artist, scoop some onto a palette and then apply with a foundation brush. If this is your own compact, you can dip your brush directly into the product. After applying to the face, take a damp sponge and blend out the foundation. This is the key to give you the "flawless skin" look. The damp sponge helps to sheer out the foundation just enough to let your skin shine through. In the video, I also show that you can use the colors for contouring. Place the darker shade in areas of your face that shadows would usually fall (hollows of cheek, jaw, temples) and the lighter shade on areas that sun would hit (bride of nose, cheekbones, chin). 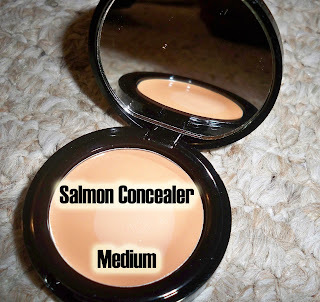 4) After applying foundation, apply the salmon concealer. I use the medium shade. I applied it with a concealer brush to my undereye circles then proceeded with blending it in with my ring finger. 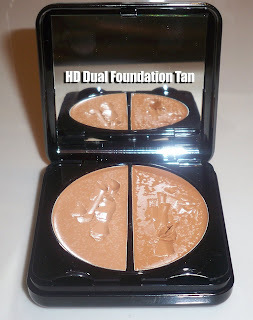 The foundation alone provides one layer of coverage so that you don't need as much concealing in the end. This product is a definitely must-have for those of you experiencing problems with undereye circles. 5) In the end, you can set your makeup with a powder of your choice. 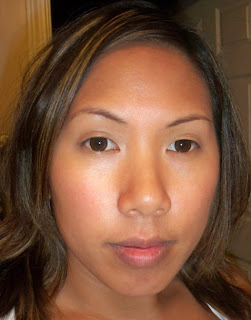 Eve Pearl has a translucent pressed powder she offers which looks good on every skin tone. This was a great tutorial! Thank you for explaining the steps, I'm one of those people who aren't able to view videos while at work! =) Eve Pearl's brand look great on you, I want it! I just have to save enough money for that ;) I don't wear foundation, but for concealer in MAC I use NC30 what foundation would you recommend? Thanks, Ren! I would like to know if this foundation give the same coverage as the STudio Fix Fluid. Thanks! this is perhaps the first turtorial were you really see flawless skin. i love it. usually people look cakey or the colors are way lighter then the rest of their neck. Wow! Your skin looks gorgeous!